How much can you win with just 250 chips? If you think you are up for the game, use your short stack skills and multiply your chips in the super short stack tournament! 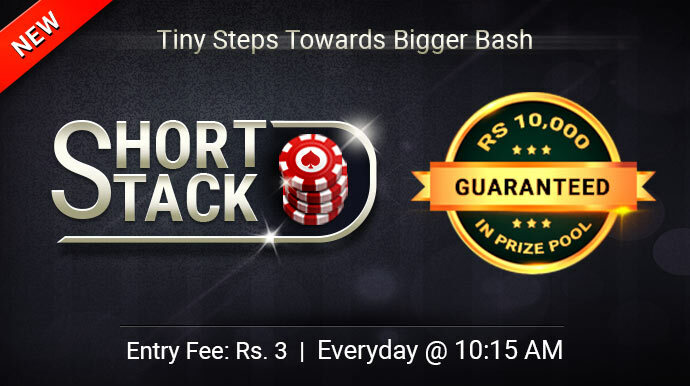 Register for the Short Stack Tournament at Ace2Three and win Rs.10,000 Prize Pool Daily! The short stack tournament runs in stake format where the players with the maximum chips progress to the higher rounds. The initial chips allotted to each tournament is 250 and the top 100 winners of the tournament will share the prize pool of Rs.10,000. Step 1: Log in to Ace2Three on your desktop computer or mobile device. Step 3: Click on the tab that says ‘Special’. Step 4: Select the ‘Short Stack’ tournament and click on the ‘Register’ button. Once registered, an entry fee of only Rs.3 will be deducted from your balance and you will be able to play in the tournament. Hurry, join now and start your day with a winning note at Ace2Three Rummy! Book your seat now!